Infatuation stimulates fantasies of permanent bonding. New love is the ultimate turn on. 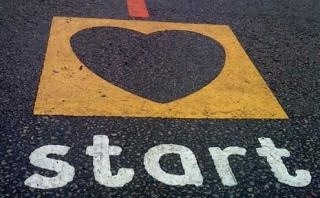 In the first moments and days of love, the neuro-chemicals that create feelings of happiness all explode out the starter gate. But does an explosion of happiness chemicals that triggers the thought “I want this person to be in my life forever!” necessarily mean that you and your new love would in fact make good chemistry together forever?Before you make a mad dash to the altar, better read on. Why do decisions to marry that are made in the early exciting stage of love, the stage of infatuation, so often turn out to be a big mistake? I recently read an exceptionally clear explanation. Early romantic experiences leave a lasting imprint on who we are—and who we fall for. Chana Levitan is the author of a particularly helpful ‘Is this the right one for me to marry?’ book. I Only Want To Get Married Once explains that infatuation is “ the spark at the beginning” that suddenly ignites with a new person or in a situation that has newly switched from businesslike or friendship to romantic and sexualized. Because that spark, that sparkling, delightfully sexually intense feeling when you first fall in love, feels so good, you are likely to want the feeling to last forever. Levitan explains that no matter how good the match, the strong sexualized draw of infatuation, even in the best of marriages, is only a temporary phenomenon associated with newness and insecurity. Levitan quotes the research of psychologist Dorothy Tennov who found that the duration of infatuation typically lasts at most “between approximately 18 months and three years.” Circumstances like a long-distance relationship or chronic relationship insecurity may articfically extend the tingling phenomenon, at the cost of delaying the shift either into a departure from the relationship or into commitment to a mature and reliable love partnership. Infatuation also poses a second trap. It’s easy to confuse loving the feeling of infatuation with the totally separate issue of how loving you are likely to feel toward that person after the infatuation has worn off. Love is blind while you are in the intital infatuation stage. After that, clarity about reality tends to emerge. 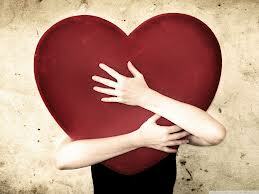 Continuing to love someone is likely to depend on how suitable that person is as a partner in the project of living. Fortunately, it’s possible to look ahead even when you are feeling swept off your feet. Your capacity for longer range vision can help you evaluate if the person you love so intensely today is likely to become a burden or an asset over time. Does your current infatuation seem to be with someone who will turn into a stranger from a strange land or someone with whom openness, intimacy and a shared life style would be possible? Would that person be a supportive partner or a controlling tyrant? The infatuation is the whole relationship. There’s nothing else there. No shared vision or values of the life pathways you both want. Minimal shared interests. Not much to talk about after the initial getting-to-know-you conversations. You’re so caught up in the chemistry of initial attraction that you can’t, or don’t want to, see who the person really is. You’re infatuated and at the same time know that the person is bad for you. You’re moving toward marriage but find yourself thinking about someone you’ve dated in the past, or looking at others you might date in the future. You know at some level that you are wasting your time enjoying being infatuated with someone whom you wouldn’t want to marry. Is infatuation a reliable guide? So are all initial strong feelings untrustworthy? Absolutely not. Strong feelings alone do not a good match make, but strong feelings plus good sense can enable couples to make a marriage choice early on that leads to a relationship that proves to be long-lasting and ever-loving. I knew the man I married for less than two months, and was thoroughly infatuated, when we decided to wed. Now, forty years, four children and ten grandchildren later I’m still thrilled with my choice of mates.Who to marry is the single most important decision a person makes in their life. It’s especially important, as Levitan puts it so nicely in the title of her book, “I Only Want to Get Married Once.” So pick thoughtfully. And once you’ve picked, make sure to learn the communication skills for marriage success! Susan Heitler, PhD is a clinical psychologist in Denver who specializes in helping couples to build strong and loving partnerships. Her book The Power of Two is the basis for the fun interactive online marriage education program PowerOfTwoMarriage.com. After being diagnosed with Borderline Personality Disorder in 2004, she started her path of recovery. As she oversees the programs of Hope for BPD, she has also served as Executive Director of a NAMI affiliate in Florida and currently serves on a local NAMI board of directors in Texas. Harvard-based researcher Mary Zanarini, PhD has called borderline personality disorder (BPD) the “good prognosis diagnosis” and there are many reasons to be hopeful about the long-term outlook. Borderline personality disorder—most frequently characterized by rapidly-changing mood swings, unstable relationships, identity disturbance, and chronic feelings of emptiness—is a mental illness with a lifetime prevalence rate of almost 6% among the general population. Time and again, research has shown that individuals who have been diagnosed with borderline personality disorder can feel better about themselves and their world, are able to work towards academic and vocational goals, sustain healthy relationships, and experience a sense of purpose or meaning in their lives. We also know more now about the neuroplasticity of the brain and understand that our brains continue to change and adapt so that we can learn new behaviors and process information in healthier ways. Family members who are in need of education and support can connect with organizations such as NEA-BPD and take part in their free Family Connections classes or NAMI’s Family-to-Family program. Remember, the vast majority of people with BPD get better and go on to create lives worth living. If you’re someone who has been diagnosed with the disorder, that means you! For more information about BPD, please visit Hope for BPD. A new study from Boston University has looked at why people use Facebook. But not in the conventional ‘to keep in touch with friends’ or ‘to share photos’ sense. Oh no, this is FAR more interesting. The study looks at human needs (think Maslow) and attempts to explain where Facebook fits within that context. The authors’ proposition is that Facebook (and other social networks) meets two primary human needs. The first is the need to belong to a sociodemographic group of like-minded people (linked to self-esteem and self-worth). Given this ‘need to belong’, it is hypothesised that there are differences in the way people use and share on Facebook according to cultural factors (individualistic v collectivist cultures). The thing is, some studies have suggested that being active on Facebook may not improve self-esteem, so we may be kidding ourselves if that’s (partly) why we use it! The second need is the need for self-presentation. Further studies suggest that the person people portray on Facebook IS the real person, not an idealised version. BUT, it’s a person as seen through a socially-desirable filter. In other words, we present ourselves as highly sociable, lovable and popular even if we sit in our bedrooms in the dark playing World of Warcraft ten hours a day. There’s an aspirational element to our online selves. And hey, for me that’s certainly true – I’m a miserable sod in real life! iPhone Addiction: Does Smart Phone = Dumber You? Source: Psychology Today, Susan Krauss Whitbourne, Ph.D. The smartphone is quickly becoming an extension of the human brain. 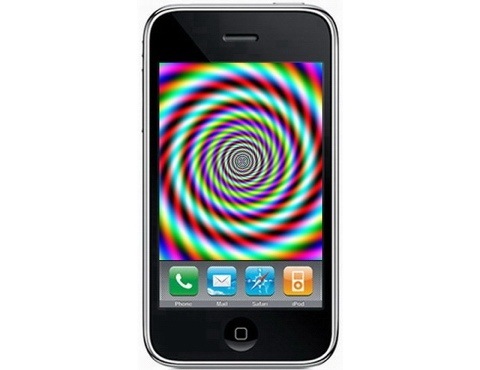 The latest entry into the market, the iPhone 4S, contains a feature named Siri that (according to the Apple website): “understands what you say, knows what you mean, and even talks back. Siri is so easy to use and does so much, you’ll keep finding more and more ways to use it.” Now, I love technology as much as anyone (at least when it’s working), but as a psychologist, I have to join in the voice of critics who yearn for a simpler, less tecnical age. It’s not that I wish to return to the pre-computer age, of paper and pencil, however. Instead, I’m worried that we risk having our brains become vestigial organs. Research on technological tools suggests that offloading our mental functions to these electronic devices could cause our brains to go soft. Consider the evidence from a study reported in late 2010 by researchers at McGill University. Neuroscientist Veronique Bohbot and her team reported that relying on a global positioning system (GPS) to get to known locations reduces the function of the hippocampus, the “seahorse” shaped structure in the brain that controls memory and spatial orientation. Participants used to getting around on the basis of their own wits had higher activity and a greater volume in the hippocampus than the older adults using a GPS. What’s more, when it came to their actual performance, the non-GPS users performed better on a memory test. Bohbot recommends that you turn off the GPS when you’re navigating around your hometown and use it only for its actual purpose of finding locations you’ve never been to before. Your hippocampus will thank you, whether you’re 16 or 60. It’s not much of a leap to extrapolate from the GPS to the smartphone. A normal cellphone can remember numbers for you so that you no longer have to do so. Confess– can you remember the actual cellphone number of the people you call most frequently? We used to rely on our neurons to hold onto these crucial bits of information. Now they reside somewhere out there in the ether. What’s worse is that most people don’t even take the time to write down a new phone number anymore. You call your new acquaintance and your new acquaintance calls you, and the information is automatically stored in your contacts. It’s great for efficiency’s sake, but you’ve now given your working memory one less important exercise. Memory benefits from practice, especially in the crucial stage of encoding. Let’s move from phone numbers to information in general. People with smartphones no longer have to remember important facts because when in doubt, they can just tap into Google. When was the last time St. Louis was in the World Series, you wonder? Easy! Just enter a few letters (not even the whole city name) into your “smart” search engine. Your fingers, much less your mind, don’t have to walk very far at all. Trying to give your brain a workout with a crossword puzzle? What’s to stop you from taking a few shortcuts when the answers are right there on your phone? No mental gymnastics necessary. This leads us to Siri, that seductress of the smartphone. With your iPhone slave on constant standby, you don’t even have to key in your questions. Just say the question, and Siri conjures up the answer in an instant. With a robot at your fingertips, why even bother to look the information up yourself? The irony is that smartphones have the potential to make our brains sharper, not dumber. Researchers are finding that videogame play involving rapid decision-making can hone your cognitive resources. Older adults, in particular, seem to be able to improve their attentional and decision-making speeded task performance when they play certain games. People with a form of amnesia in which they can’t learn new information can also be helped by smartphones, according to a study conducted by Canadian researchers (Svobodo & Richards, 2009). The problem is not the use of the smartphone itself; the problem comes when the smartphone takes over a function that your brain is perfectly capable of performing. It’s like taking the elevator instead of the stairs; the ride may be quicker but your muscles won’t get a workout. Smartphones are like mental elevators. Psychologists have known for years that the “use it or lose it” principle is key to keeping your brain functioning in its peak condition throughout your life. As we become more and more drawn to these sleeker and sexier gadgets, the trick will be learning how to “use it.” So take advantage of these 5 tips to help your smartphone keep you smart: 1. Don’t substitute your smartphone for your brain. Force yourself to memorize a phone number before you store it, and dial your frequently called numbers from memory whenever possible. If there’s a fact or word definition you can infer, give your brain the job before consulting your electronic helper. 2. Turn off the GPS app when you’re going to familiar places. Just like the GPS-hippocampus study showed, you need to keep your spatial memory as active as possible by relying on your brain, not your phone, when you’re navigating well-known turf. If you are using the GPS to get around a new location, study a map first. Your GPS may not really know the best route to take (as any proper Bostonian can tell you!). 3. Use your smartphone to keep up with current events. Most people use their smartphones in their leisure time for entertainment. However, with just a few easy clicks, you can just as easily check the headlines, op-eds, and featured stories from respected news outlets around the world. This knowledge will build your mental storehouse of information, and make you a better conversationalist as well. 4. Build your social skills with pro-social apps. Some videogames can actually make you a nicer person by strengthening your empathic tendencies. Twitter and Facebook can build social bonds. Staying connected is easier than ever, and keeping those social bonds active provides you with social support. Just make sure you avoid some of the social media traps of over-sharing and FOMO (fear of missing out) syndrome. 5. Turn off your smartphone while you’re driving. No matter how clever you are at multitasking under ordinary circumstances, all experts agree that you need to give your undivided attention to driving when behind the wheel. This is another reason to look at and memorize your route before going someplace new. Fiddling with your GPS can create a significant distraction if you find that it’s given you the wrong information. Smartphones have their place, and can make your life infinitely more productive as long as you use yours to supplement, not replace, your brain. Reference: Svoboda, E., & Richards, B. (2009). Compensating for anterograde amnesia: A new training method that capitalizes on emerging smartphone technologies. Journal of the International Neuropsychological Society, 15(4), 629-638. doi:10.1017/S1355617709090791 Follow Susan Krauss Whitbourne, Ph.D. on Twitter @swhitbo for daily updates on psychology, health, and aging and please check out my website,www.searchforfulfillment.com where you can read this week’s Weekly Focus to get additional information, self-tests, and psychology-related links. Northwestern University researchers have provided new biological evidence suggesting that the brain works differently when memorizing the face of a person from one’s own race than when memorizing a face from another race. Their study — which used EEG recordings to measure brain activity — sheds light on a well-documented phenomenon known as the “other-race effect.” One of the most replicated psychology findings, the other-race effect finds that people are less likely to remember a face from a racial group different from their own. The discovery of a neural marker of successful encoding of other-race faces will help put these ideas to the test, according to Paller, who directs the Cognitive Neuroscience Laboratory in the Weinberg College of Arts and Sciences. “The ability to accurately remember faces is an important social skill with potentially serious consequences,” says doctoral student Lucas, lead author of the recently published study in Frontiers in Human Neuroscience. “It’s merely embarrassing to forget your spouse’s boss, but when an eyewitness incorrectly remembers a face, the consequence can be a wrongful criminal conviction,” she adds. The Northwestern team found that brain activity increases in the very first 200 to 250 milliseconds upon seeing both same-race and other-race faces. To their surprise, however, they found that the amplitude of that increased brain activity only predicts whether an other-race face (not a same-race face) is later remembered. Previous research has associated this very early phase — what is known as the N200 brain potential — with the perceptual process of individuation. That process involves identifying personally unique facial features such as the shape of the eyes and nose and the spatial configuration of various facial features. When the researchers asked the 18 white study participants to view same-race faces and to commit them to memory, the individuation process indexed by N200 appeared “almost automatic — so robust and reliable that it actually was irrelevant as to whether a face was remembered or not,” says Lucas. Minutes later, the participants were given a recognition test that included new faces along with some that were previously viewed. The researchers analyzed brain activity during initial face viewing as a function of whether or not each face was ultimately remembered or forgotten on the recognition test. The N200 waves were large for all same-race faces, regardless of whether or not they later were successfully remembered. In contrast, N200 waves were larger for other-race faces that were remembered than for other-race faces that were forgotten. In contrast to individuation (which involves rapidly identifying unique physical attributes from faces), elaborative encoding is a more deliberate process of inferring attributes. For example, you might note that a face reminds you of someone you know, that its expression appears friendly or shy, or it looks like the face of a scientist or police officer. Making these types of social inferences increases the likelihood that a face will be remembered. Why is individuation so fragile for other-race faces? One possibility, the researchers say, is that many people simply have less practice seeing and remembering other-race faces. “People tend to have more frequent and extensive interactions with same-race than with other-race individuals, particularly racial majority members,” Lucas says. As a result, their brains may be less adept at finding the facial information that distinguishes other-race faces from one another compared to distinguishing among faces of their own racial group. Another possible explanation involves “social categorization,” or the tendency to group others into social categories by race. 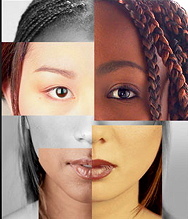 “Prior research has found that when we label and group others according to race we end up focusing more on attributes that group members tend to have in common — such as skin color — and less on attributes that individuate one group member from others,” Lucas says. As a result, smaller N200 brain potentials for other-race faces — particularly those that were not remembered later — could indicate that race-specifying features of these faces were given more attention. The Northwestern researchers expect future research to build on their findings in the continuing effort to better understand the other-race effect. “That research also will need to focus more on face recognition in minorities, given that the bulk of research to date has examined majority-white populations,” Lucas says. 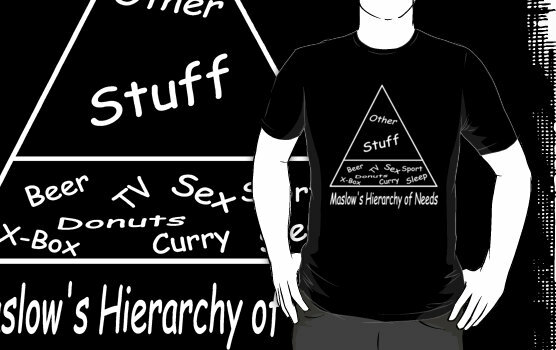 The Great Pyramid: Did Maslow Get The Hierarchy Of Needs Right? For more than 60 years, psychologist Abraham Maslow’s hierarchy of human needs has served as a model by which many judge life satisfaction. But his theory has never been subjected to scientific validation. A new global study tested Maslow’s concepts and sequence, in a way that reflects life in the 21st century. Maslow proposed that people who have these needs fulfilled should be happier than those who don’t. In the new study, U of I researchers put Maslow’s ideas to the test with data from 123 countries representing every major region of the world. To determine current perceptions, the researchers turned to the Gallup World Poll, which conducted surveys in 155 countries from 2005 to 2010, and included questions about money, food, shelter, safety, social support, feeling respected, being self-directed, having a sense of mastery, and the experience of positive or negative emotions. 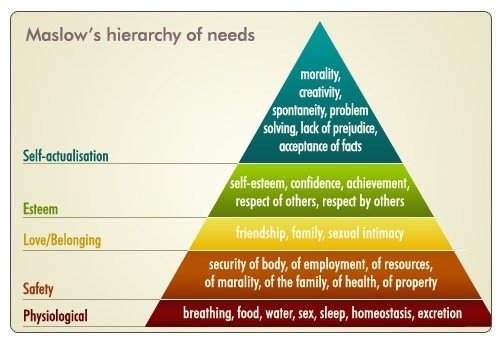 The researchers found that fulfillment of a diversity of needs, as defined by Maslow, do appear to be universal and important to individual happiness. But the order in which “higher” and “lower” needs are met has little bearing on how much they contribute to life satisfaction and enjoyment, Diener said. They also found that individuals identified life satisfaction (the way an individual ranked his or her life on a scale from worst to best) with fulfillment of basic life needs. The satisfaction of higher needs – for social support, respect, autonomy or mastery – was “more strongly related to enjoying life, having more positive feelings and less negative feelings,” Diener said. An important finding, Diener said, is that the research indicated that people have higher life evaluations when others in society also have their needs fulfilled. “Thus life satisfaction is not just an individual affair, but depends substantially also on the quality of life of one’s fellow citizens,” he said. “Our findings suggest that Maslow’s theory is largely correct. 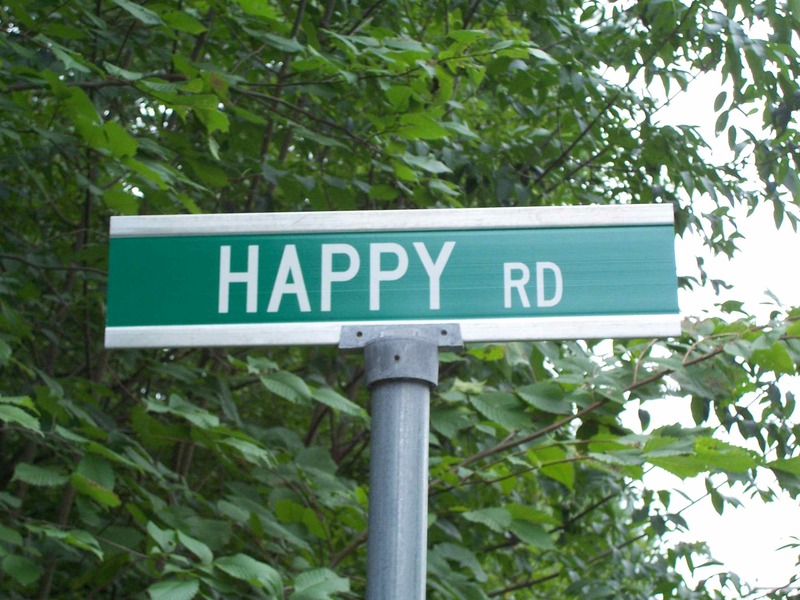 In cultures all over the world the fulfillment of his proposed needs correlates with happiness,” Diener said. Shyness, Loneliness And Facebook:Is It Easier To Be Friends In Cyberspace? 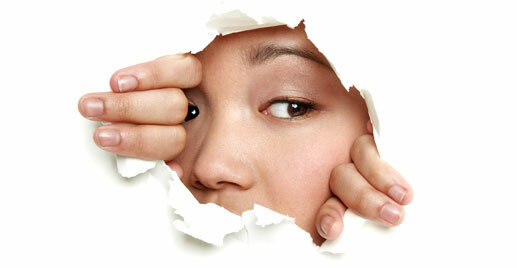 Do shy individuals prefer socializing on the internet? And if so, do they become less shy while on the internet and have more friends? In 2009, the journal CyberPsychology and Behavior published an article that investigated this issue. Specifically, the researchers investigated the relationship between shyness and Facebook use. The study was conducted by Emily S. Orr and her colleagues from the University of Windsor. To examine this relationship, 103 undergraduate students from a university in Ontario completed an online questionnaire that assessed self-reported shyness, time spent on Facebook, number of Facebook friends, and attitudes towards Facebook. The results of this questionnaire indicated that shy individuals tended to have fewer Facebook friends and reported spending more time on Facebook. They were also more likely to have a more favorable attitude towards Facebook than those who were less shy. Orr and her colleagues believe that the relative anonymity provided by Facebook may explain the increased use of and favorable attitude towards Facebook. Shy individuals may find Facebook appealing because of “the anonymity afforded by online communication, specifically, the removal of many of the verbal and nonverbal cues associated with face-to-face interactions,” as Orr and her colleagues explain. Those who find face-to-face communication uncomfortable may use Facebook as a way to remain connected to the social world while avoiding physical social interaction. Orr, E.S., Sisic, M., Ross, C., Simmering, M.G., Arsenault, J.M. & Orr, R.R. (2009). The influence of shyness on the use of facebook in an undergraduate sample. CyberPsychology and Behavior, Vol 12, No 3: 337-340.